Walt Disney Productions continued operating without Walt in much the same fashion as it did when he was alive, sticking to a formula that worked. Based on the book Rascal: A Memoir of a Better Era by famed newspaper editor Sterling North in 1963, the studio was inspired to adapt it into an uplifting animal film. An who better to make it than the same team behind the other great Disney films of it's ilk. Norman Tokar, who started his Disney career directing another animal movie called Big Red, was chosen to direct. Harold Swanton adapted the screenplay after doing Willie the Yank for The Wonderful World of Color. Bill Mumy was cast as Sterling, having previously stared in Disney's TV movie Sammy, the Way Out Seal. John Fiedler, voice of Piglet, plays their gardening neighbor in his first on-screen role for Disney. Steve Forrest plays his father in his first of two Disney roles. Jonathan Daly also begins his Disney career here as Reverend Griffith. Character actress Elsa Lanchester plays a picky housekeeper in her final disney role (most memorable as Katie Nanna in Mary Poppins). Famous actor Walter Pidgeon narrates as sixty-year-old Sterling Holloway. The film was shot on soundstages and the backlot at the Disney Studios in Burbank, as well as nearby Golden Oak for outside shots. Matte paintings help convince that audience that this is Wisconsin at the turn of the century. The film begins with young Sterling North walking with his dog and a raccoon as the narrator recalls back to his boyhood and the most unique friend he ever made. A series of vignettes are depicted during the credits of the boy and his raccoon riding bikes, eating ice cream, etc... The film then flashes back to before Sterling met his funny friend on the last day of school. When his dad picks him up from school, they have a heart-to-heart about the recent death of Sterling's mother. When their dog Wowser chases a raccoon away from her home, her babies follow... except for one. Feeling sorry for the little fellow, Sterling's dad takes him in and they name him Rascal. When his father and sister leave Sterling home with a housekeeper who abandons him, he fends for himself and lives happily with Wowser and Rascal. He occupies his summer building a canoe while his teacher and reverend express their concerns about how much time the boy spends without adult supervision. Summer ends with a race between a horse-drawn carriage and a motor car. The story flashes to Thanksgiving when Sterling's sister comes home for a visit with her fiance. When she finds out that Sterling spent most of the summer alone, she gets furious and resumes household duties and cancels the marriage. Her dad is able to convince her that he will stop being an absent father and stay home. When Rascal fights to get out of the house and Sterling tries to stop him, Rascal bites him. He realizes that he can't keep him forever. Sterling takes Rascal out in his finished canoe and sets him free in the forrest, where he meets a girl raccoon. They are quickly chased by a bobcat, but Sterling witnesses Rascal defeating the beast and knows he will be fine. The film ends with Sterling sailing away and giving his dear friend a goodbye wave. Rascal was released on June 11th, 1969. It got mixed reviews, praised for the performances but bashed for being overly sentimental. It wasn't much of a box office draw and debuted on TV a short time later in 1973. It didn't make its home video debut until 2002, when it arrived simultaneously on DVD and VHS. I first enjoyed Rascal during it's home video release. 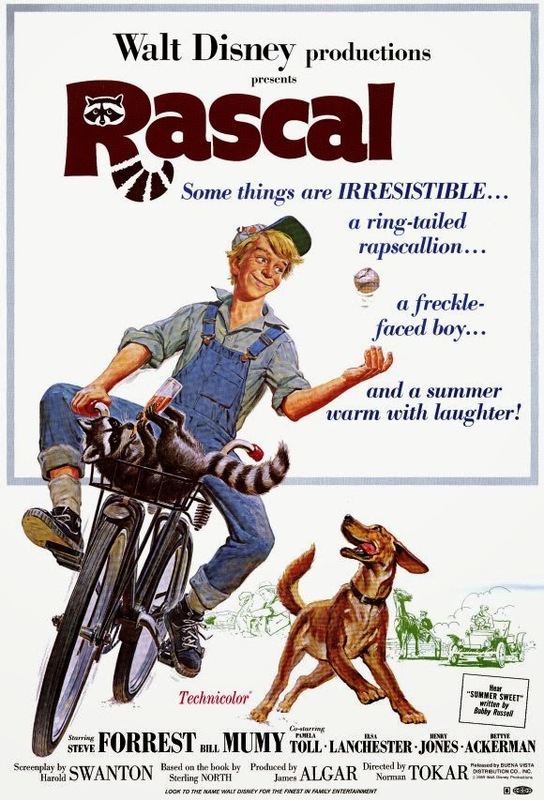 Growing up in Wisconsin and being a fan of period films at the turn of the century, I really connected to Rascal. To me, it feels like the first scene of Walt Disney's Carousel of Progress expanded into a film. Bill Muny is so likable and the animal actors are so appealing that it's hard to not enjoy it. When Sterling and Rascal say goodbye at the end, you get the same sense of melancholy cultivated at the end of The Fox and the Hound. There's also a lot of hidden gems to make Disney fans keep their eyes peeled. The neighborhood the Holloway's live in is the same Residential Street used in the filming of classics like The Absent-Minded Professor and That Darn Cat. It was common practice for studios to reuse props and set pieces in other productions. Viewers with a keen eye will notice some items in the Holloway home from Pollyanna. Rascal was the first film professionally reviewed by Gene Siskel, who gave it a thumb down. Rascal is still available on DVD, with a transfer that was marginally restored, but with room for improvement. The film was presented there in pan & scan fullscreen, but the film was theatrically release with a widescreen aspect ratio 1.78:1. There aren't any bonus features on the DVD. The film is now available on iTunes, where it can be purchased in widescreen (1.66:1, gaining some image on the top and bottom that wouldn't have been seen in theaters). The HD restoration is flawless, making the film look like it could have been produced today.